We wanted to do it. So it’s finally going to happen. That’s right, PSP will buy Philadelphia Union host our first postseason party. And you’re invited. The MLS Cup final will be on the TV. For those not familiar with The 700, it’s a local pub in Northern Liberties that oozes soccer street cred. Soccer scarves adorn the walls. The bar opens early on weekends to show the early morning European games (and American football never supersedes soccer [Editor’s note: At least when Ed is working]). Union tickets are typically available to whoever wants to join the 700 crew in tailgating before games. PSP’s managing editor, Ed Farnsworth, even bartends there on the side. And that cover photo? 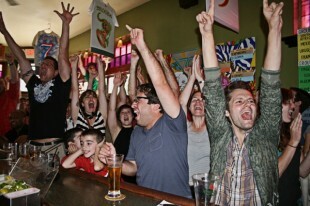 Yes, that was the reaction at The 700 when Landon Donovan scored his famous game-winner against Algeria in the 2010 World Cup. So come on out. We’ve wanted to do this for a few years now, because we love meeting and hanging out with our readers, and reader interest was enough this year that we’re taking the shot. So … see you there? If Ed can get a kiddy pool in the bar, I may even perform one of my World Championship belly flops. My daughter and I should be there, barring any unforeseen circumstance. Too bad it’s the same day as the Union holiday party at PPL Park. My wife and I are going to be getting our pictures taken there. Yeah, we didn’t like that either. But realistically speaking, we saw that this was still by far the best day to do it. MLS Cup is a better context for an event than, say, coming out on a Saturday morning to watch a random EPL game or something. Fortunately, you can hit both events if you want to, as the PPL event starts around 2, I believe. You could hit PPL and then head up to The 700 after if you wanted. that’s what I was planning to do..
Well, guess we will be ditching PPL park after our photos…hope Ed’s gonna be able to handle all of us crazies! Is Amobi gonna be spinning upstairs? Sounds like a lot of fun. Thanks for pulling this together. Correct, no food at the the 700. We’re planning on seeing how many people show up and then ordering pizza. Beer, soccer, *and* pizza? Damn, my Saturday afternoon just got even better!